There are very few opportunities during which someone else pays my bill at a restaurant. My boyfriend and I are long past the point of trying to romance one another into a relationship. After nearly a decade, we’ve dumped the niceties and take turns paying restaurant bills. Fairness keeps the fire alive, I tell ya. My parents stopped taking me out to dinner during college — I let it slip that I preferred a home-cooked meal when I returned home to visit. So I did a little happy dance in my swivel chair when a Courier-Journal reporter offered to buy me lunch for an interview. I used the interview as an opportunity to complete the $10 Challenge, even though the Courier-Journal would pay for my meal. Just because you don’t have to empty your wallet, doesn’t mean someone else should go broke for your meal. Matt and I visited River Bend Winery in downtown Louisville. Sneeze, and you’ll miss this establishment. I hear the word “winery” and my thoughts go to acres of vineyards, quaint cottages and bearded former hippies pouring the latest pinot noir. But River Bend Winery operates out of a 100-plus year old building on 10th Street between Market and Main streets. Not the most remote of locations for a winery/restaurant. The urban vibe inside the winery trumps the lack of scenery. With the exposed beams, expensive paintings and abundant natural light, I felt like I had crept into a pricey uptown loft. I also felt like I walked into a restaurant I couldn’t afford. Fortunately, the restaurant portion of River Bend Winery offers some surprisingly great midday deals. The lunch menu was fairly short, but full of tantalizing sandwiches such as the Chicken Salad Seduction ($6.95) and the Wine House Gobbler ($7.50). They also included old standbys such as a BLT ($6.95) and a cheeseburger ($6.95). The most expensive item on the lunch menu was the Barrel House Rib-eye Sandwich that was reasonably priced at $8.95. The prices on the lunch menu seem like they are from an entirely different restaurant after a glance at the winery’s dinner menu. The costs almost double in the evening. The average price of the four dinner entrees is $17.25. Good thing for the Courier-Journal that I came for lunch. The salad’s inclusion of cranberries, toasted almonds and grapes. The woman in the table behind me raved to her friends about how good great it is (the small dining room was empty enough to meddle easily in other conversations). Sandwich seduction -- for the grown and hungry. The chicken salad was loaded with hunks of chicken and plenty of grapes, my favorite feature of chicken salad. The consistency was hearty and highlighted by the recurring crunch from the grapes. And the focaccia, though not adorned with any onions, cheese or other topping, was buttery and fresh. The bread had a nice crisp exterior and was soft and thick on the inside. 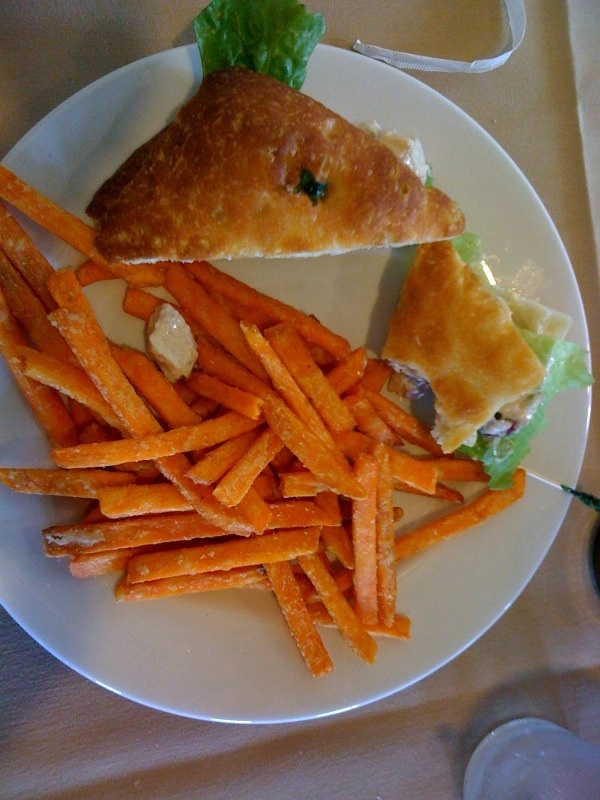 I squealed on the inside after my first bite of the sweet potato fries, one of four sides that you can choose to accompany a sandwich. The fries were fairly flat, which created the perfect shape for grabbing a bunch to eat at once. The fries were salty enough to be reminiscent of a regular potato french fry, but sweet enough to remind you that you’re eating a whole different kind of spud. This is the best french fry dish I have had in a long time and rivals my all-time favorite potatoes, the Five Guys cajun fries. Other than the poor service (bless the waiter’s heart, he was working the bar AND he was the only server), the experience at River Bend Winery was a success. The meal showed me that you can afford to dine at a very nice establishment if you just go for lunch instead of dinner. And it never hurts to have a reporter with you who will pick up the ticket. River Bend Winery, 120 South 10th Street, Louisville, Ky.
*For folks who are interested, I will be in next week’s Velocity, which comes out June 23. Flip to the last page and I should be there. Yippee!!! PLEASE make sure to get, like a million copies so I can “read” one. i can’t wait to see what he says! you’re about to blow up.